For Bucangeda Serges, jealousy of his neighbours' agricultural and economic success spurred him on to make positive changes for himself and his family. In his own words, here is Serges' story. "For many years, I always thought that growing staple crops like beans, cassava, potatoes, and maize was sufficient to feed my family. I did not have an interest in growing other foods like vegetables and fruit, which I considered to be a waste of time. My children rarely ate fruit, and if they did, we had to buy from the market. One day, in October 2012, a meeting was called at the school, and I attended. In the meeting, the local FH Burundi staff, Anne Marie Nzayisenga, was promoting the importance of fruit and vegetables, showing beautiful pictures taken from my neighbors’ farms. FH Burundi had provided those neighbors with Japanese tomatoes seeds, carrots, spinach, onions and amaranth seeds. They started to grow fruit and vegetables on their farms. During the meeting, the neighbors shared testimonies on how much they were collecting and how profitable this was for them and for their families. By the time the meeting ended, I was feeling some kind of jealousy, and I was determined to do like my neighbors, or more than them. I started with a small quantity of seedlings, only 40 Japanese tomato plants and a small garden of vegetables. Very soon the fruit ripened and my children enjoyed them. In 2013, my interest was growing, and I planted 150 Japanese tomato plants. I got a good harvest to give to my family and enough to sell at the local market at BIF100 a batch. I used the money I got from the profits to provide for other needs of my family like paying the labors working on my farms, buying petrol for the paraffin lamp to help my children read their homework at night. I also intend to buy 500 tiles to cover my house at a value of BIF450, 000. I thank God and I thank FH Burundi for opening my eyes. Keeping a kitchen garden and planting fruit has improved the diet and income for my family. As the years go by, I continue to improve my techniques and expand the size of my garden. I have now learned and know well how to establish a fruit tree nursery and kitchen garden." Bucangeda Serges is a 50 year old man living in Musema, Kayanza in Burundi. He is considered one of the "most vulnerable" among the poor that FH Canada works with. 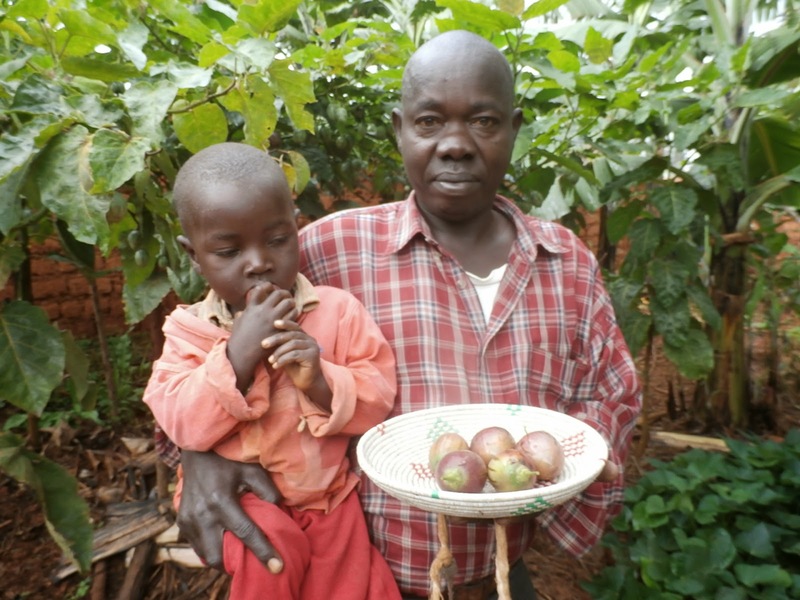 The changes he made by starting a vegetable garden and fruit tree orchard produced a real transformation in the family's living conditions - both their diet and income dramatically improved. Support more men like Serges by investing in agricultural education programs.